Congressman, 1901-23, Democratic majority leader, 1915-19. Opposed war declaration; later supported Wilson's war policies. Home is here. 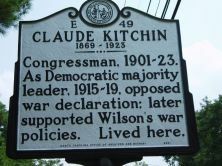 Congressman Claude Kitchin, born on March 24, 1869, was the third child of United States Representative William H. Kitchin and his wife Maria. 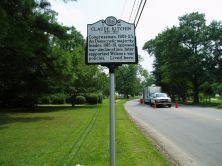 Claude followed his brother, William W. Kitchin in attending Wake Forest College and practiced law in Halifax County after his graduation in 1888. In September 1890 he married Kate Mills, the daughter of Luther Mills, a senior member of the Wake Forest faculty. Claude Kitchin entered politics at the behest of his father and brothers. The Kitchins, lifelong Democrats, were leading members of the Farmers’ Alliance, a Populist movement in the 1890s. However, when the Populists and the Republicans began joining forces and pandering to the African American vote, the Kitchins became appalled at the likelihood of black Republicans gaining elective office, especially the Congressional seat. During the turbulent elections of the 1890s, Claude Kitchin stood out as a white supremacist leader at the county and state level and organized the Red Shirts, bands of armed men who assaulted and intimidated black voters. Kitchin gained a popular following among the county’s white voters for his beliefs and actions, leading to his election to United States House of Representatives in 1900. On April 9, 1920, Kitchin delivered a speech in Congress opposing the possibility of America signing a separate peace with Germany on the grounds that it would place the countries on an equal footing in further peace negotiations. Finishing his oration, Kitchin collapsed from a paralytic stroke. He returned to Congress briefly after brain surgery in 1921, however contracted pneumonia and influenza shortly thereafter. William S. Powell, ed., Dictionary of North Carolina Biography, III, 373-374–sketch by Richard L. Watson Jr.
Claude Kitchin. Photo courtesy of the North Carolina Office of Archives and History.